Michigan home of the Motown Sound, The Motor City, Bob Seger and the Silver Bullet Band, Ted Nugent, Kid Rock and oh yes over 1,000 golf courses!! Sitting down with the Michigan tourist board the discussion was focused on how we could replicate a typical golf tour from Britain and Ireland on a fact finding trip to Michigan, all were agreed the focus should be on golf. Golfers in the UK find themselves in a difficult position at the moment, with the strength of the Euro against the Pound, the annual pilgrimage to Portugal, Spain and recently Turkey has started to become very expensive. With the strength of the Pound against the Dollar, it’s a great chance for UK golfers to take a look again across the Atlantic to golf in America. There are plenty of flights between the UK and Detroit or Chicago (which is only a 90 minute drive to Northern Michigan). With over 1,000 tracks to choose from, many of which appear in Golf Digests Top 100 you will be in for a real treat. It offers a comfortable summer climate to play in, add to that the breath taking scenery, especially in the UP (Upper Peninsula) region, the great Lakes, a warm friendly welcoming people and there is not much you will not enjoy on your visit to Michigan. After lots of email exchanges I was on my way to the Motor city to play 14 courses in 12 days!! We could have included some fishing, there is plenty to be had or spa’s, there are some fantastic resorts for you to enjoy, but for me golf, golf and more golf, I was very happy with that itinerary. I played links inspired courses, parkland courses and heathland courses. Courses where the land was donated by the Dodge family, land that was donated by the Jesuits, courses built over working gas fields and reclaimed wasteland. Every course has a story and many of the people who work there, would be happy to tell you the tail of how their course was born. 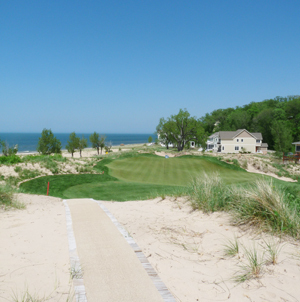 If you haven’t decided where to go next year on your annual golf trip, then I would strongly recommend you take a look at what Michigan has to offer. If you have already booked, then make this one of your must-play destinations of the future. When your sitting at the bar with that well deserved cold drink in your hand, looking out over the 18th green to Lake Michigan at Arcadia Bluffs, you will be happy you did. Glad you enjoyed the read, I loved the state and the courses I played. I have been assured there are plenty of other fantastic courses in Michigan to enjoy.